Grilling season is upon us and this recipe is destined to end up in your recipe collection. 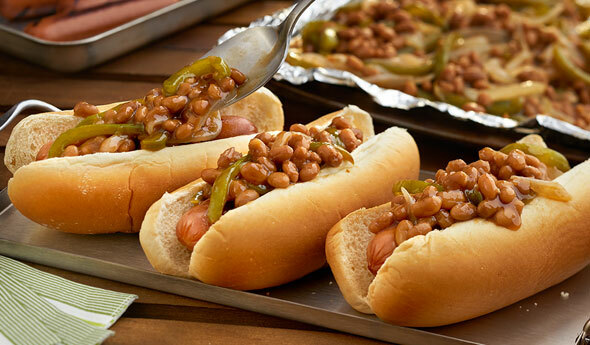 Baked beans with bourbon brown sugar, sliced onion and green pepper are spooned into a foil packet and grilled to perfection. The result is a hot dog topper that's full of great flavor! Heat the grill to medium. Stir the beans, onion and pepper in a large bowl. Spoon the bean mixture in the center of one (18-inch) foil square. Top with the remaining foil square and double fold the edges to seal. Grill for 25 minutes or until the vegetables are tender, turning the foil packet over once halfway through the grilling time. Place the hot dogs in the buns. Top with the bean mixture. Easy Substitution: You can substitute kielbasa or other sausage for the hot dogs. Recipe Note: Instead of making a foil packet, you can place the bean mixture into a disposable aluminum pan and cover with foil before grilling. Alternate Preparation: Instead of grilling, you can bake the foil packet at 425°F. directly on the oven rack for 30 minutes or until the vegetables are tender.